"Big, weighty-rye with an attitude. In a herd of any 30 random bourbons, this one would stand out by nose alone. The taste is puckering and mouthwatering, the ryes go ballistic, especially on the spice front. With salivation levels on full blast, it is sometimes hard to pick out the more delicate custard-cream and apple nuances. The oak finish kicks in at the death with a shot of liquorice and coffee. But the ryes refuse to be downbeaten. A shade heavier than when I first tasted this one with the oak showing a burlier attitude. However, the unique rye fizz ensures a delightful and by no means understated degree of charm. Fabulously different and wholly adorable." (46.85 ABV) This is s Fantastic slow sipper, has a caramel and vanilla sweetness, almost toffee in taste, its one that you keep going back to. I really enjoy this its up there with Elijah Craig. 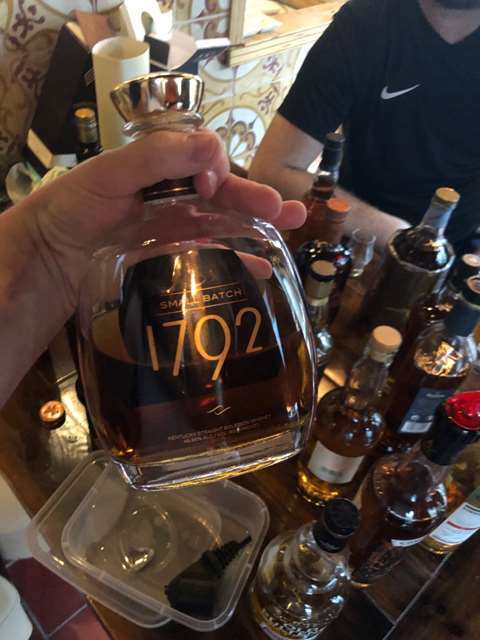 Klik hier om 1 actuele prijs te bekijken van Ridgemont Reserve 1792 Small Batch.